Sports watches come in a wide range of styles and designs. While they all offer and play up features that allow wearers to tackle elements of the great outdoors, it is quite amazing just how varied sports watch design can be. Still, resin watches have often gotten short shrift in the general perception of sports watches. Some ‘purists’ still think that resin watches fall apart under pressure or are simply not up to the job of helping wearers navigate their way out of desserts, mountain peaks, or jungle valleys. To top it all off, these people think that sports watches intended for extreme active lifestyles can’t look good. Boy, are these folks wrong. The reason? One name: Casio. That’s right-the same company that was dismissed decades ago as a calculator manufacturer hopelessly out of its league in the world of high-precision time pieces has gone on to dominate the sports watch market. Need proof? Whether you need a watch that is specifically designed for deep diving, frigid terrain, or mountain climbing, and points in between, there’s a Casio sports watch model geared to the terrain you want to conquer. That’s how dominant Casio has become. With the G-Shock Solar Watch, Casio shows that it can also design the dickens out of a typical active lifestyle watch and make it look great for indoor events. If this seems amazing, don’t forget that this is Casio we’re talking about. Usually, people often associate the ‘cool’ look of sports watches as coming from their sporty appeal and their hints of a rugged lifestyle. In short, they look good based on their sporty function. It is not commonly thought that sports watches can look good in the classic sleek sense. 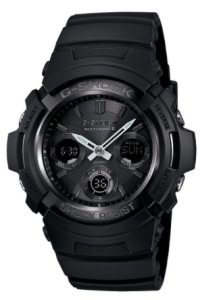 Well, if you think this way, you need to lay your eyes on the Casio Men’s AWGM100B-1ACR “G-Shock” Solar Watch. With the AWGM100B, you have a sleek, cool, and oh-so-urbane timepiece that you can always trust with the time since it is solar-powered. Talk about an ideal marriage of form, function, and attitude. As mentioned above, sports watches are often perceived as good-looking based on their sporty features. They aren’t normally viewed as stylistically appealing due to their intrinsic design. Well, Casio didn’t step on its design brakes when crafting the Casio Men’s AWGM100B-1ACR “G-Shock” Solar. This time piece plays up its solar feature and looks amazing. In fact, its solar feature is part of the reason it looks so sleek and modern. The biggest price booster of timepieces are normally their movement assemblies. Since this watch is powered by quartz and solar, you get to save money while enjoying precision performance. Telling the time at night won’t be a problem with this great watch-even if you were trying to figure out London time. Thanks to its multi-city function, you can find the time in any of the 48 global cities it covers. Solar-powered, you don’t have to worry about batteries for this timepiece. Casio clears another hurdle with this model. Not only can this proven Japanese manufacturer produce mission-critical timepieces that can take a beating, Casio has shown, with this model, that it can make sports watches look real good as well.